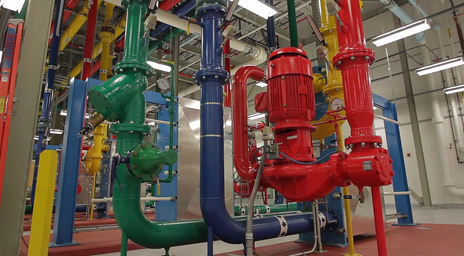 Updated: Google is a total champ when it comes to its infrastructure, and a blog post Monday shows the search giant is running its data centers at a power usage effectiveness (PUE) of 1.14. The PUE metric is a measure of how much extra power is required to provide each unit of compute. So, in Google’s (s goog) case, its data centers only use 14 percent more power for everything that isn’t the servers. But wait, is that right? Google later in the post claims that the version of PUE that gives it the 1.14 ranking is more comprehensive than others tends to use. Google tosses in power lost to AC/DC conversions, cooling offices associated with the data center and other bits and pieces. Counting only the servers and the air conditioning gives Google a PUE of 1.06. So why might this matter? Well, PUE is the metric to beat in the race to greener data centers, and Google may have just beat Facebook’s Prineville data center by a tenth of about one percent. To calculate this number we include everything that contributes to energy consumption in our data centers. That means that in addition to the electricity used to power the servers and cooling systems, we incorporate the oil and natural gas that heat our offices. We also account for system inefficiencies like transformer, cable and UPS losses and generator parasitic energy draw. The average data center PUE is about 1.8, but Facebook, with its Open Compute-designed servers and focus on designing everything from the data center all the way to the application, has a PUE of 1.07. But we’re still waiting for Facebook to say whether or not its PUE measurements include the everything-but-the-kitchen-sink metric Google is using, or the more-simplified version. Update: Facebook said it’s 1.07 PUE includes the conversion losses Google is measuring as part of its 1.14 number, but excludes the power associated with heating or cooling the data center offices. Facebook uses its solar array to power those. Yes, that same solar array that Amazon’s James Hamilton recently scoffed at when it came to providing power in the data center. Facebook isn’t using it to power servers, just the places where sys admins have to congregate. The bottom line is Facebook still looks better than Google when it comes to this figure. Either way, Google and Facebook are some of the few firms getting close to the ideal PUE of 1. Meanwhile, other data centers are seeing how low they can go. Recently, eBay announced a new data center (s ebay) that has a PUE of 1.35, and Yahoo (s yhoo) has designs that can deliver a PUE of 1.08. However, some of the largest data center owners in the world, including Amazon, (s amzn) Microsoft (s msft) and Apple (s aapl), so far have refrained from making their PUEs public. Microsoft said last year that it would aim for a PUE of 1.25 across all of its data centers by April 2013. Amazon’s data center guru James Hamilton published a presentation on Amazon last year that assumed a PUE of 1.45 for the online retailer’s data centers. Apple doesn’t appear to have said anything so far, although it has hired the gentleman behind Yahoo’s chicken coop design, with a PUE of 1.08, to manage its data center build out. I’ve reached out to Apple, Amazon and Microsoft for more information on their current PUE status and will update the story if I hear back. Update: Microsoft sent me a bunch of information on its PUE figures for its newest data centers which range from 1.13 to 1.2. It doesn’t disclose the PUE for all of its data centers, however. So, if the question is how low can you go, then Google and Facebook have more to crow about among the biggest operators, while Microsoft is improving, Amazon is a mystery and Apple is even more of a mystery. That sounds about right. Well, actually your math isn’t perfect either. 1% of 1.07 is 0.0107, therefore their decrease from 1.07 to 1.06 was ~0.93%. OVH is one of the biggest european hosting company, they’re much less hype than those Web Giants, make much less noise, but interestingly they’ve announced last year that their new datacenter has been designed mostly to rely on ventilation for server cooling rather than on air conditioning. They’ve achieved a PUE of about 1.1. Very nice article. The state of the art has clearly moved beyond the PUE = 1.0x era; we need to start “looking at the 1.” Making every Watt in the data center compute is a great start, but how efficiently is the IT gear getting work done? There are lots of efforts to quantify this. One effective approach (clarifies the message to make it comprehensible to the CIO ) is the “DCUE” concept I blogged about on the Intel server room. Clearly it needs some industry input to flesh out things like I/O and storage. Work to be done!!! The next measurand will be how many watts per terabyte/IO bandwidth. Or some such measure of the actual efficiency of the big things in the building.